I hope everyone had a wonderful holiday weekend. We had a fantastic time that involved a lot of food and chatter. We had a day of snow and some brisk cold weather at the farm but overall it was a blast! I shared some of my photographs of the farm both here and on Facebook and Instagram. 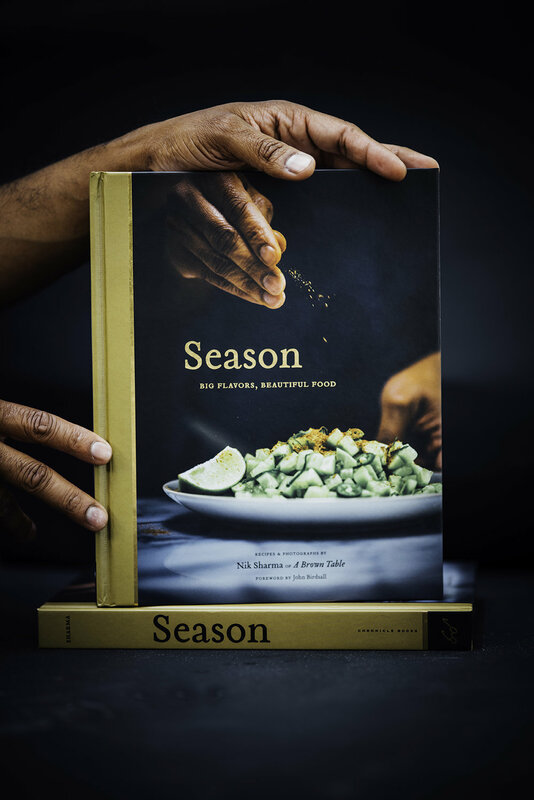 Instagram has slowly become one of my favorite photography social networks and it is so much fun to use, it's also where you can get sneak peek of what recipes are to come in the upcoming weeks. I have to admit that I am glad to be back home because now I can look forward to Christmas and our winter vacation to California. This year, since the holidays tend to get a bit rich and heavy, I will add a few lighter posts and share some of my favorite recipes that are my go-to-detox meals during this carb heavy period of the year. This is one of my favorite squash recipes because it's tasty and super easy to make. "Pulled" barbecue spaghetti squash infused with the sweet, sour and hot flavors of a light barbecue sauce make this a delicious dish with a lot of versatility. At a more formal occasion, I will serve this in the form of tartines for an appetizer but if I've also served this by itself for lunch as a sandwich. The flavors are simple yet bold. 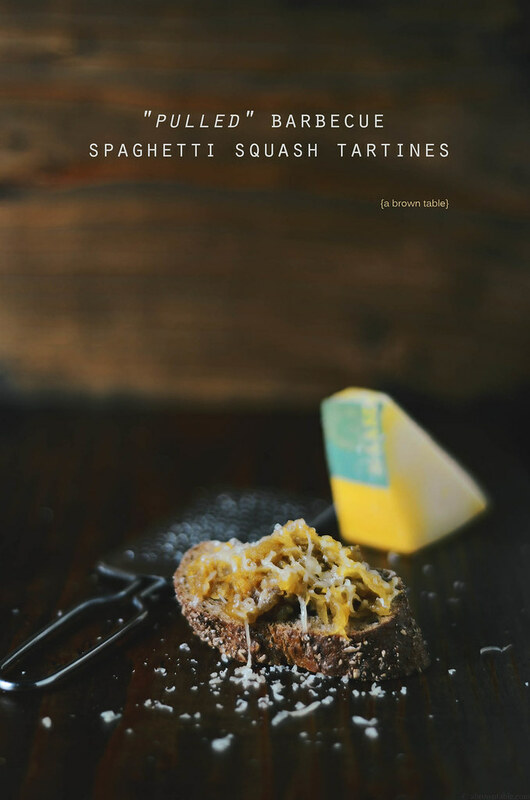 When you take a bite, you will immediately taste the melted cheese followed by the sweet, sour and hot notes of the squash, it's a wonderful sensory experience that's lighter and guilt-free. I've gone with a North Carolina Piedmont barbecue sauce here that is vinegar based but made a couple of changes. The balsamic vinegar gives the sauce a woody yet sweet touch which balances out the heat of the chili flakes. You can serve the finished tartines with a little more leftover sauce on the side. A good beer or dark ale go really well with these tartines. 1. Preheat the oven to 350F. Slice the squash in half, remove and discard the seeds and strings using a spoon. Place the cut, exposed surface of the squash on a baking sheet tray lined with parchment paper. Rub the olive oil lightly over the surface of each halved squash. Bake in the oven on the middle rack for 45min-1hour. The squash is cooked when you are able to prick the flesh of the squash easily with a fork. Remove from the oven and allow to cool for 15 minutes. Scoop out the flesh of the squash into a large mixing bowl and keep aside. The squash will automatically shred out into strings. Discard the outer skin. 2. While the squash is baking, mix the rest of the ingredients in a thick bottomed saucepan. Stir on a medium high flame and bring to a boil. Remove the sauce from the stove and keep aside. 4. Once again, preheat the oven to 350F. 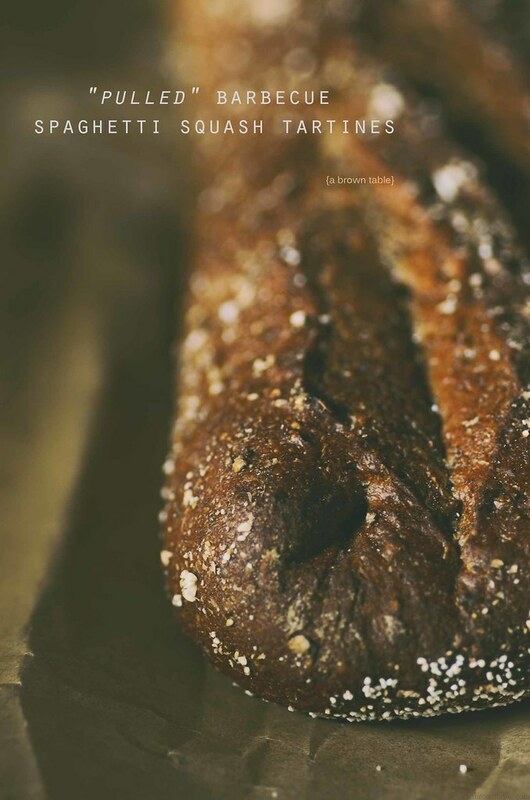 Slice the baguette into 1/2" thick slices. Lay them out on a baking sheet lined with parchment paper. Brush each slice lightly with the olive oil. 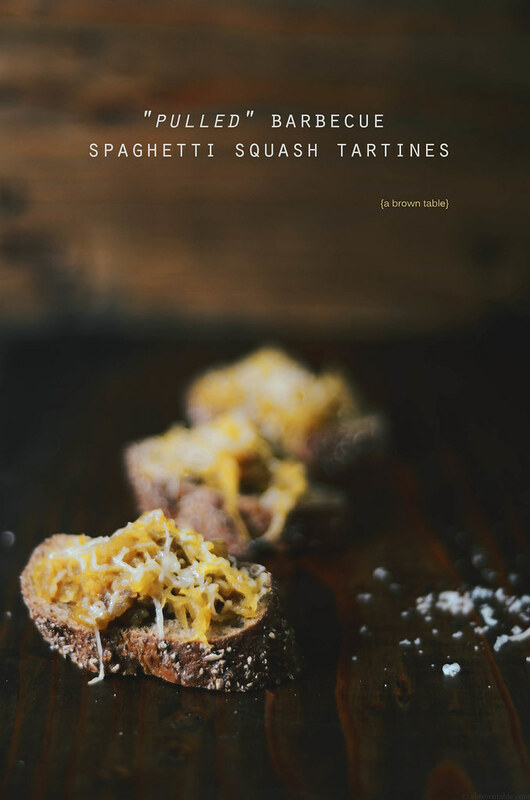 Top each slice with a generous amount of the squash and sprinkle a little cheese on top. 5. Place the tray in the oven and bake them until the cheese begins to melt. Around 5-7 minutes. Remove and serve warm. Note: If you prefer more sauce, I recommend serving the sauce on the side. This prevents the bread from getting too soggy and the tartines will hold their structure. 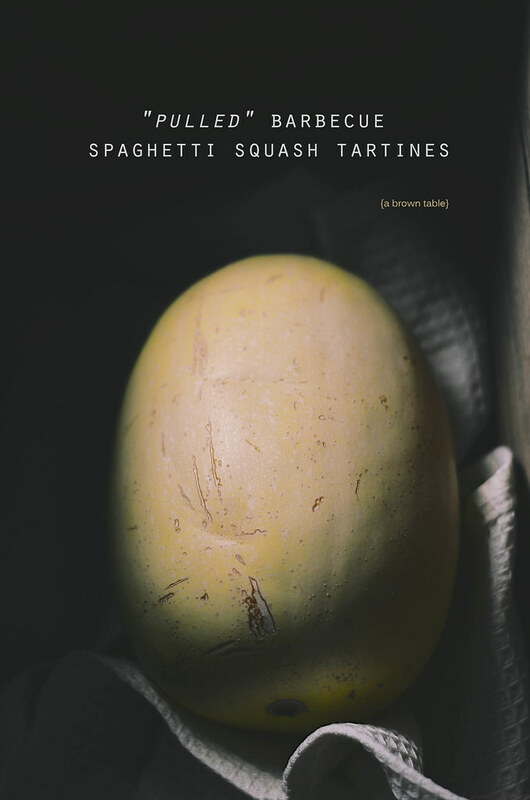 In "Squash", "Tartines", "Vegetarian", "barbecue", "bbq", "spaghetti squash"